Getting things from Fedora Project. Media, stickers, and other stuff like pens, cheat cubes, t-shirt, and any other stuff that you can imagine. For those things you should make a ticket on your regional trac. Where swag wrangler should see how to fulfill your request. To be honest there are regions where this works better than others. But in any case, you have to comment on your ticket realistically how much swag do you need, for what event, and when is the dead line for those materials. Your event, no matter how small it is should be listed on the event wiki (until we have a better way of doing it). It is expected that you make a blog post or a brief report on the ambassador mailing list about your event and how the swag you got was distributed. Of course blog post with picture are better. And please leave a link to your blog post on the event wiki as report. Travel subside, local production of materials like banners, or buying stuff for use in events. For those things you open a ticket on famsco trac. With exception that if it is a travel subside for fudcon, then it should go to fudcon trac. When you open a travel subside it is important to explain why it is important that you travel to that event. What will be accomplished. In the other hand if you are putting together and release party, probably you will need some money for decoration, drinks and things like that. Well, again it should be listed on the fedora events, you have to provide detail of the expenses, better if you can provide a quotation. Again it is nice to have a blog post explaining what you did and photos showing how you used the resources. I think I need to explain more in details, but that will be new blog post. This is just a general introduction. Obtener cosas del Proyecto Fedora. Discos, calcomanía (pegatinas o adhesivos) y otras cosas como bolígrafos, cubos truqueros, camiseta y cualquier otra cosa que te puedas imaginar. Por esas cosas que usted debe hacer una entrada en su trac regional. Donde Swag Wrangler debería ver la forma de cumplir con su solicitud. Para ser honesto, hay regiones donde esto funciona mejor que otras. Pero en cualquier caso, hay que comentar en su ticket de forma realista cuánto material usted necesita, para qué evento, y cuando es la fecha límite para esos materiales. Su evento, sin importar lo pequeño que sea debe incluirse en la wiki de eventos (hasta que tengamos una mejor manera de hacerlo). Se espera que haga un blog o un breve informe sobre la lista de embajadores acerca de su evento y cómo los materiales que consiguió fue distribuido. Por supuesto, con fotos los blog son mejores. Y por favor dejar un enlace a su blog en la wiki del eventos como reporte..
Subsidio en los viajes, la producción local de materiales como carteles, o la compra de material para su uso en eventos. Por esas cosas que se abre un ticket de FAmSCo trac. Con la excepción de que si se trata de un viaje para participar en FUDCon, entonces debe ir a FUDCon trac. Cuando se solicita un subsidio de viajes es importante explicar porqué es importante que usted viaje a ese evento. Lo que se llevará a cabo. Por otro lado, si usted está preparando una fiesta de lanzamiento, probablemente usted necesitará un poco de dinero para la decoración, las bebidas y cosas por el estilo. Bueno, de nuevo debe ser incluido en los eventos de Fedora, usted tiene que proporcionar los detalles de los gastos, mejor si usted puede proporcionar un presupuesto. Una vez más, es bueno tener un blog lo que han hecho y las fotos que muestran cómo se utilizan los recursos. Creo que tengo que explicar más en detalle, pero que será en nueva entrada de blog. Esto es sólo una introducción general. I was invited to spend the morning in the Legislative Parliament of Costa Rica. They have a presentation for middle management about free-software. The parliament is going to migrate and the want to kill all myth before rumors start. Carolina Flores has been working on free-software diffusion very successfully, recently introducing to small enterprises. She made a very nice introduction for non-technical people. 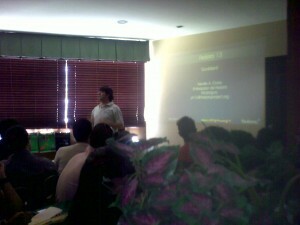 Alonzo Castro from the Universidad de Costa Rica gave a talk about the migration process on the University. He explained very well how a migration can be a very ordered and conscious process, looking for the opportunities where free-software will yield best results and not pushing in areas where it will not worth the effort. Last come Oscar Retana with a example of large scale free-software deployment on bank institutions coexisting with very specific proprietary software showing that now in Costa Rica there are business that can provide support for institutions looking ti migrate to free-software. The president of the parliament showed up to stress the importance of this meeting, and just as casual I was standing there to shake his hand. Very exiting morning. Finally was show time in the Universidad de Costa Rica, the time for the release party. Just walking to the room I spotted some advertisement posted on the walls about the event. It was nice to see Katherine Alfaro again. Just one month before I was speaking on the same University and she steeped forward saying that she wanted to be Fedora Ambassador, and then she applied and organized a release party. I was carrying media, stickers, leaflets, cheat cubes and a roll up banner. But she already had in place a nice decoration and she got some blank media to provide 64bits for those who request it. It was a informal gathering in what is like a student club. There were two computers to demonstrate Fedora and a copying tower for burning media. We were doing casual talking and later, I was asked to make an informal talk. I covered a bout Fedora Project about a friendly community, the goals of the project, some new features of the latest version. We had a questions and answers session and resume the casual talk. At this point I got more deep questions. I do like informal events, I feel that formal presentation build distance between the collaborators and the public. After everything was packed, I have some time with Katherine to talk about Ambassadors role and some guidance. Time was short but we make the most of it. I am looking forward to heard what they are going to do next in Costa Rica, and help them if I can. A mi invitaron a pasar la mañana en la Asamblea Legislativa de Costa Rica. Tenían una presentación sobre software libre para los mandos medios de la Asamblea. En la Asamblea van a migrar a software libre y ellos quieren acabar con los mitos antes que los rumores inicien. Carolina Flores ha estado trabajando en la difusión de software libre de manera exitosa, recientemente presentando a pequeñas empresas. Ella hizo una excelente introducción a software libre para personas no técnicas. Alonzo Castro de la Universidad de Costa Rica dió una charla sobre el proceso de migración de la Universidad. Él explicó muy bien como una migración puede ser un proceso ordenado y consciente, buscando las oportunidades donde el software libre va a brindar los mejores resultados y no empujando áreas donde no vale la pena el esfuerzo. Al final habló Oscar Retana con un ejemplo de implementación de gran escala de software libre en el sector bancario coexistiendo con software propietario muy especifico. Él estaba mostrando que ahora en Costa Rica existen negocios que pueden proveer soporte para instituciones que buscan migrar a software libre. El presidente de la Asamblea Legislativa se presentó para hacer énfasis en la importancia de esta reunión. De casualidad yo estaba de pie ahí, para estrechar su mano. Una mañana muy emocionante. Finalmente era la hora esperada en la Univeridad de Costa Rica, la hora de la fiesta de lanzamiento. Mientras caminaba al salón vi un cartel de aviso sobre el evento. Fue bonito encontrar a Katherine Alfaro de nuevo. Solamente un mes atrás yo estaba dando una charla en la misma Universidad y ella dio un paso al frente diciendo que quería ser embajadora del proyecto Fedora. Ella aplicó y organizó una fiesta de lanzamiento. Yo iba cargando discos, calcomanías, cubos truqueros, panfletos y un banner. Sin embargo ella ya tenia montada una bonita decoración, y además tenía discos en blanco para quemar discos de 64 bits para quienes los solicitaran. Era una reunión informal en lo que es como un club de estudiantes. Habían dos computadoras para demonstrar Fedora y la torre de duplicar para quemar los discos. Estuvimos conversando casualmente con los asistentes y luego fui invitado a tomar la palabra. Yo hablé acerca del Proyecto Fedora como una comunidad abierta, los objetivos del proyecto, un poco sobre las nuevas características de la reciente versión. Luego pasamos a una sesión abierta de preguntas y respuestas, .para luego volver a nuestra forma casual de platicas. En se momento recibí preguntas más profundas. Realmente me gustan los eventos informales, me parece que las presentaciones formales crean una distancia entre los colaboradores y el publico. Luego que todo se empacó, yo tuve algún tiempo con Katherine para hablar sobre el rol de Embajador y brindarle algunos consejos. El tiempo fue corto pero lo aprovechamos al máximo. Yo estoy ansioso de escuchar que es lo siguiente que van a hacer en Costa Rica y ayudarlos si me es posible. I think that 55 responses is good, but having more responses is better. So I am giving away a sneak peek to let all of you know how this is going and create interest in completing the survey. So far the entries are 73, with 55 completed and 18 pending. I went to the questionnaire and picked some questions to show a little bit of the data we have gathered. #1 – In which region are you located? #12 – Do you feel you can reach a FAmSCo member whenever you need something? #14 Do you have any comments? There are 18 comments, some are about the survey itself, but there are some positives and I would like to share the following. I have been impressed by the way Fedora encourages people to become involved, and the Ambassadors have been very good for spreading information–especially with the mentor thing. I have no idea of who wrote that, as there is no way to link response with users. 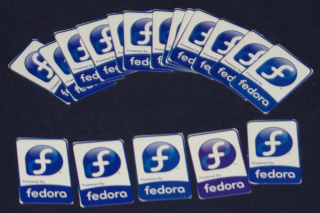 But that is what I like the most about Fedora Project: encourages people to become involved. We will be closing the survey by the end of June 2011. Nosotros iniciamos el día extrañando a José López, quien no logró viajar desde San Salvador para el evento en Ciudad de Guatemala. Yo espero que el sepa que si no asiste al evento en Managua, él va a estar en graves problemas. Como invitado extranjero me dan extra atención, así que me toco presentarme ante la multitud en mismo inicio del evento. La fiesta de lanzamiento se realizó en un salón de un restaurante. El lugar estaba abarrotado, principalmente con gente nueva ante el software libre. Habí un gran grupo de estudiantes de diseño. La primera charla fue acerca de que es una comunidad de software libre y el contexto en Guatemala. Esta vez mi charla fue sobre las características nuevas de Goddard, pero antes de eso inicé por hablar acerca de la más maravillosa de las comunidades de software libre: El Proyecto Fedora. Yo hice enfasis en la gran mejora que va a ocurrir en el mundo Linux gracias a Color Management. Claro esto es desde el punto de vista de los diseñadores gráficos. Las charlas continuaron, pero yo me ubique en una mesa junto a la entrada contestando preguntas y repartiendo calcomanias, cubos truqueros y discos. Yo hice una lista de personas que obtuvieron discos, asi el grupo local podra dar algun seguimiento a esas personas nuevas probando Fedora. Fui entrevistado por un blogero serio en el tema de software y tecnología y además estuve bajo fuego pesado de preguntas de usuarios expertos en Linux. Yo creo que pase sus pruebas. Tuve suficiente tiempo para hablar con Edna, quien ha sido recientemente aceptada como Embajadora. Yo le di mi reconocimento porque ella ha hecho un magnifico trabajo con esta linux Party que fue creada principalmente por la fiesta de Lanzamiento de Fedora. Nosotros también compartimos muchas ideas de como podemos mejorar nuestra comunidades locales de Fedora, y más importante aun como nosotros seguir adelante con esta integración regional. La última parte del evento era extender una invitación a participar y mantenerse en contacto. Yo hable por parte de Fedora haciendo refrencia a los recursos disponibles que ofrecemos para conectar esta participación. El coneto de almuerzos fue de 68, pero yo estoy convencido que el coneto de cabezas debió estar cerca de 80. Nosotros terminamos el evento, pero el día estaba lejos de acabar. Existe una reunión de software libre todos los sábados y no pensaba perdermela. Tampoco el grupo local de Fedora iba a dejar pasar una oportunidad de mostrar como nos apoyamos entre nosotros. Pero eso probablemente ya sea tema para otro post. We started the day missing José López, who wasn’t able to travel from San Salvador for the event in Guatemala City. I hope he knows that if he missed upcoming event in Managua, he will be in real trouble. As a foreign guest I got plenty of attention, so I have to introduce myself to the crowd at the very beginning. The launch party was held at one saloon in a restaurant. The place was pack, mostly with people fresh to FOSS. There was a big group of design student. The fist talk was about what is a FOSS community and the Guatemalan context. My talk this time was about new features in Goddard, but I started first talking about the most wonderful FOSS community: Fedora Project. I stressed out the great improvement that will occur because of Color management on the Linux world. Talks continued but I settle on a table next to the door answering questions, giving away some stickers, cheat cubes and media. I kept a log of people getting media so the local group can give some follow up to those people trying out Fedora. I was interview by a serious blogger on software and technology, and also went under heavy questions fire from some deep knowledgeable Linux users. I think that I pass their tests. I got plenty of time to talk with Edna who has been recently accepted as Ambassador. I gave encouragement as she has done a superb job with this Linux Party that was setup mainly because of Fedora Launch Party. We also shared a lot of ideas on how we can improve our local Fedora Community and more important how we can keep up with this regional integration. Last part of the event was to extend a invitation to participate, to keep in touch. I talked on Fedora’s behalf referring to the resources that we offer to bridge this participation. The lunch count was of 68 but I am pretty sure that head count should be around 80. We ended the event, but the day was far from finishing, there is a FOSS Social meeting every Saturday and I can not missed. Neither local Fedora team will pass on an opportunity to show off how we support each other. But that probably goes for another post. 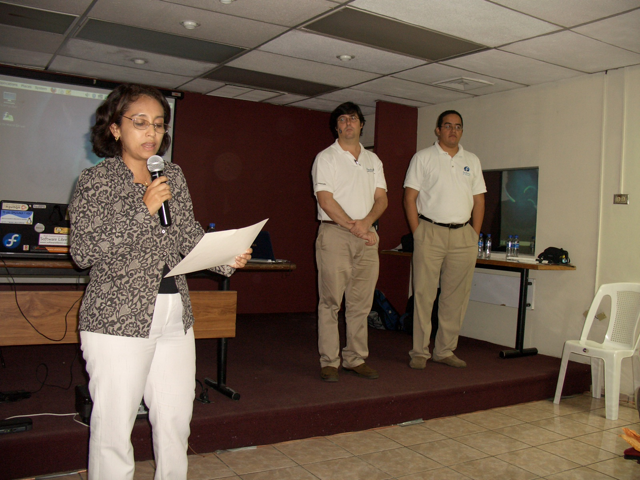 La escuela de Computación del ITCA FEPADE fue sede del Lanzamiento de Fedora 13 en San Salvador. José López arreglo que estudiantes de Sistemas y Redes estuvieran presente. Muchos de ellos ya habian probado linux en algun momento. Tuvimos una parte protocolaria por parte de las autoridades del instituto y me pasaron el micrófono para una improvización sobre que es el Proyecto Fedora. El auditorio estaba completamente lleno, talvez unas 120 personas. José López hablo sobre las libertadades, el sistema operativo Fedora y las novedades de Goddard. Mostramos un poco el escritorio LXDE y más ampliamente el escritorio Gnome. Mi charla fue sobre como usar el cache de yum para tener un repo en una memoria usb. El objeto es mostar algunos elementos de yum y como hacer instalaciones de paquetes en computadoras sin internet. 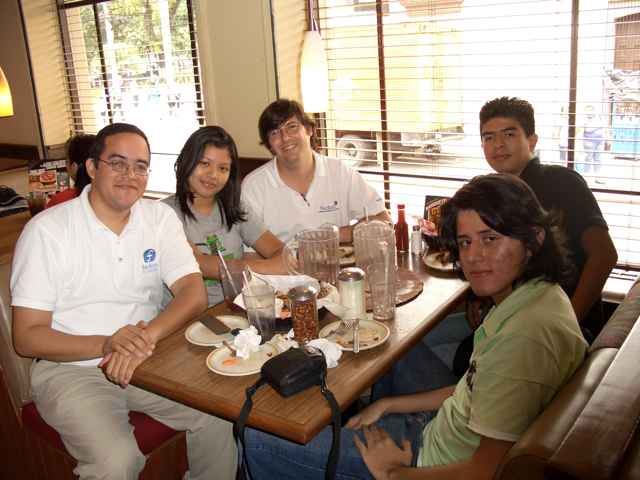 En el intermedio de almuerzo fuimos rápido a Pizza Hut compartiendo con los miembros de la comunidad de software libre de El Salvador. Todo el día estuvo lleno de rifas y trivias, donde los participantes podian ganar camisetas, discos, calcomanias y cubos truqueros. En la tarde tuvimos una charla sobre como colaborar con las comunidades y otra sobre un proyecto llamado Open Education que esta usando como base Fedora. Lamentablemente no pude escuchar esta última charla porque tuve que correr hacia el aeropuerto. Al proximo día estaría participando del Lanzamiento en Ciudad de Guatemala. 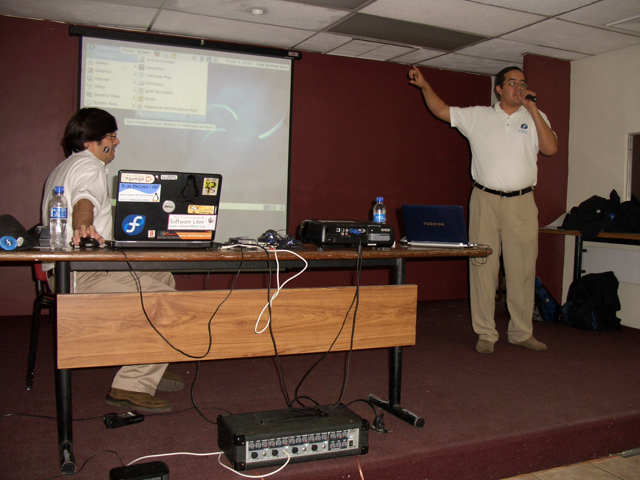 ITCA FEPADE’s Computing School was the location for the Fedora 13 Launch Party at San Salvador. Jose Lopez arranged that students with mayor in Systems or Networks get free time to attend. Many of those students have tried Linux at some point. We had or formal side with authorities of the institute and the I got the mic for an impromptu about Fedora Project. The auditorium was pack with about 120 people. Jose Lopez talked about Freedom, Fedora OS and the new features in Goddard. We showed a little bit of LXDE desktop and cover more in deep Gnome Desktop. My talk was about using yum’s cache to create and portable repo in a usb stick. The objective was to show some features of yum and how to install software in a computer without internet. During lunch break we take a quick meal at Pizza Hut sharing with members of the FOSS community from El Salvador. The whole day was full of raffles and trivias. Winners got t-shirts, media, stickers and cheat cubes. In the afternoon we got a talk about how to participate and collaborate with the FOSS Community and another in a project based on Fedora named Open Education. Regrettably, I was not able to listen to this talk as I have to run to the airport. Next day I will be participating on the Launch Party at Guatemala City. Un día más como embajador de Fedora. El sábado tuve la oportunidad de tratar de convencer a alguien de convertirse en Embajadora de Fedora. Estaba participando en el Congreso Guatemalteco de Software Libre. Sus preguntas fueron en varios niveles. Para mi las más interesantes eran sobre la reacción e independencia entre Fedora y Red Hat. Realmente me deje llevar por mi entusiasmo sobre la independencia de Fedora para buscar nuevas formas de innovar y hacer crecer al Software Libre. Pero habían más preguntas. Otro grupo de preguntas estaban enfocadas a cuales son las funciones de un embajador. No podría ser un mejor ejemplo para ella puesto que ninguno tiene formación formal en computación. Le explique que los embajadores son promotores. Si bien es bueno poder contestar preguntas a los usuarios, hay muchos recursos para dirigirlos y eso es igualmente valioso. Finalmente llegamos a la parte difícil. Ese día habíamos repartido 25 DVD y 25 LiveCD (Gnome y KDE). Los discos son los últimos de un paquete que recibí en Fudcon en Junio de 2009, el único aporte que he recibido. En total 100DVD y 100 CD, todos en blanco con sus sobres. Me preguntó si me los entregaron impresos, le respondí que el diseño era cortesía de Tatica. Finalmente terminó sacando que yo había hecho la impresión en los discos. 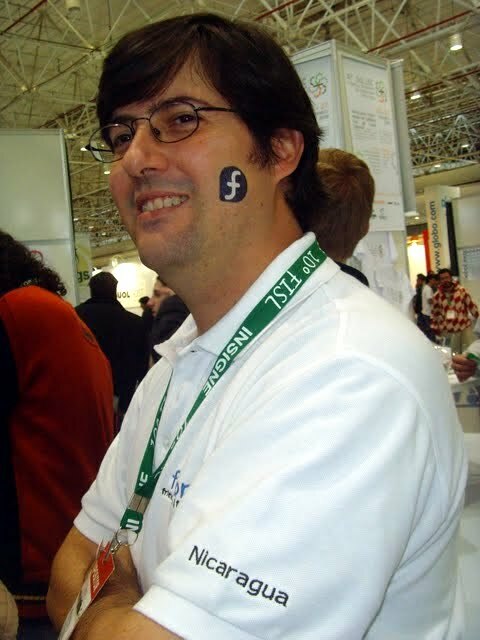 Lo mismo que las calcomanías, el banner y hasta las camisetas que se rifaron durante la presentación que se hiciera del Proyecto Fedora por parte de Magjogui. De los discos, 25 DVD y 25 CD ya habían sido entregados a el grupo naciente de El Salvador, con quienes he tratado de llevarme lo más cerca posible. El resto de discos fueron distribuidos por Yaderv en el SFD 2009 en Managua. Muchos de los embajadores de latinoamérica trabajamos así, con nuestros recursos. Buscamos algún patrocinio local, ponemos de nuestros fondos. Realmente no me pesa trabajar así, pero es más difícil conseguir gente que tenga tanto amor por Fedora para convertirse en Embajadores. Esa charla me despertó más ganas de trabajar por Fedora, pronto se realizará el evento de lanzamiento de Fedora 12 en Managua y hay cosas que alistar. Entre ellas un nuevo banner, puesto que el de Nicaragua tomó camino para El Salvador. Espero que esta líneas comprometan a mi nueva a amiga para convertirse en una nueva embajadora en Guatemala, que muchas falta nos hace ayuda por aquellos lados. Another day as Fedora Ambassador. Last Saturday I had the opportunity of trying convincing some one to became Fedora Ambassador. 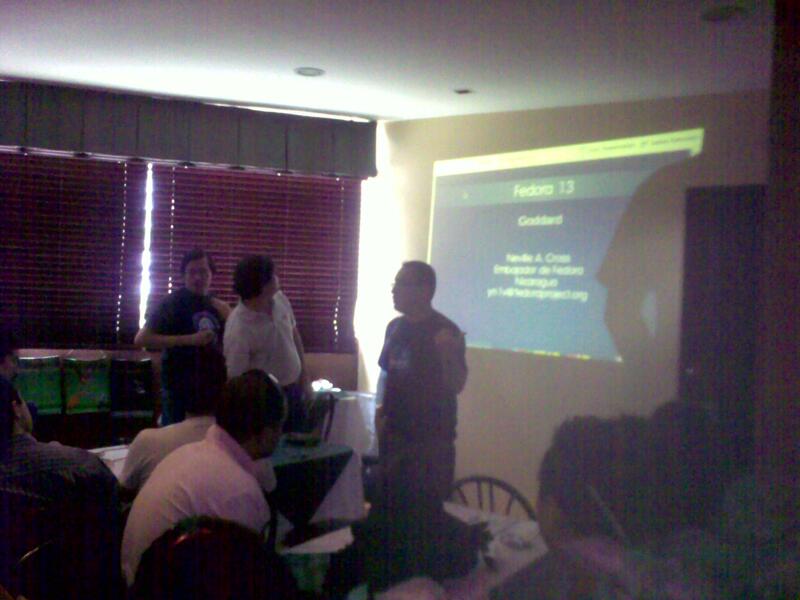 I was participating of the Guatemalan Free Software Congress. Her question addressed several levels. Her most interesting questions for me were regarding the relationship and independence between Fedora and Red Hat. 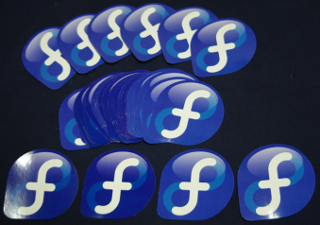 I really let myself carry on by the enthusiasms about the independence of Fedora to pursue new way of innovation and to further advance Free Software. But there were more questions. Anothe group of questions were focused on the role of an ambassador. I can not be a better example for her, as none of us have a formal training on computing. This allowed me to explain that ambassadors are promoters. It is nice to be able to answer some user questions, but there are plenty of resources. Most of the time it is equally valuable to just point them in the right direction. Finally we get to the rough part. 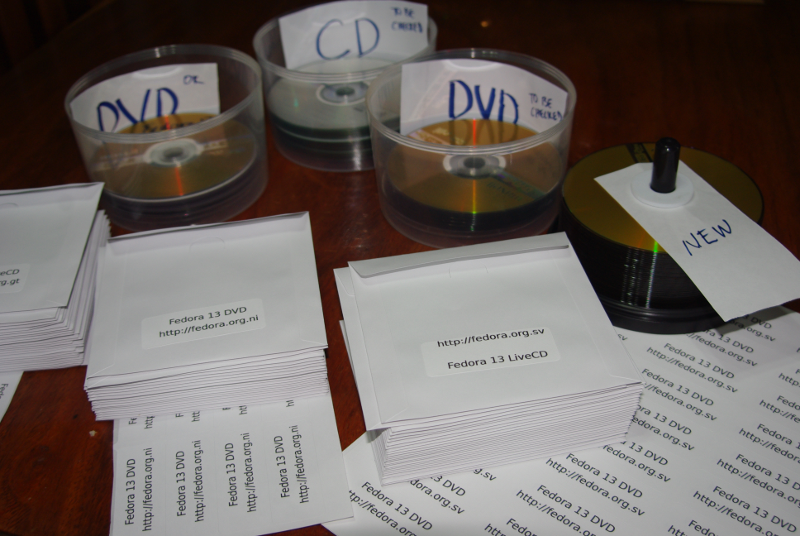 That day we have distributed 25 DVDs and 25 LiveCDs (Gnome and KDE). Those discs were the last part of a package that I got at Fudcon in June, 2009. This is the only resource received from Fedora. 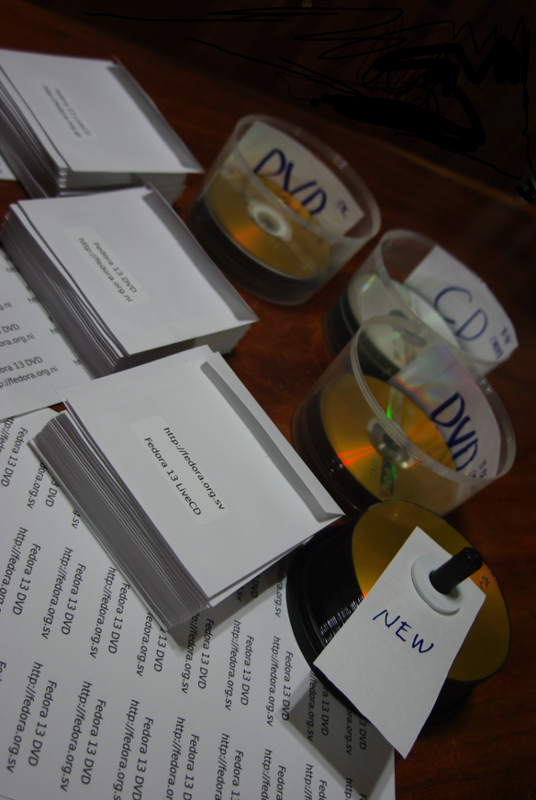 In total 100DVD and 100CD, all blank with their envelope. She asked me if they were given printed. I said that the design was made by Tatica. Finally she dig up that I have take care of the printing. Just as the stickers, the banner and even the t-shirts that were raffled during the Fedora Project presentation given by Magjogui. From all discs, 25 DVDs and 25 CDs had been given to the recently formed group in EL Salvador. I have been trying to be close to them as much as possible. The rest were distributed by Yaderv on Software Freedom Day at Managua. A lot of Latin American Fedora Ambassadors work like this, with our own resources. We look for local sponsorship and put from our own money. I don’t have regrets of working like that, but it is really difficult to look for people that love that much Fedora to become ambassador under those terms. That talk awaken a feeling to keep up the work for Fedora. 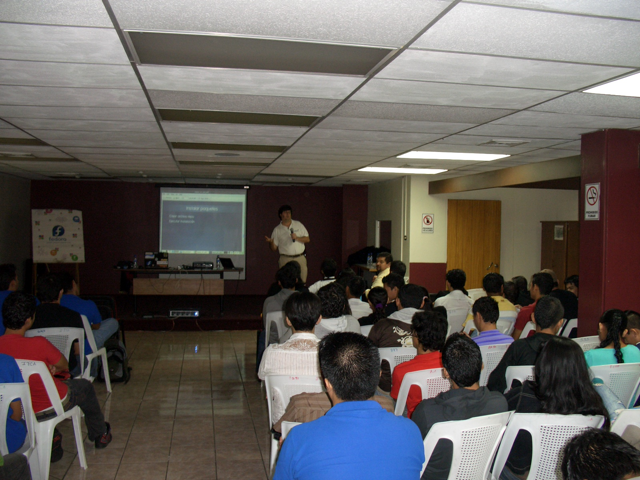 Soon there will be the Fedora 12 Launch Party at Managua, and there is plenty to arrange. Among them we have to make a new banner, as the Nicaraguan banner took the road toward El Salvador. Hope this lines compel my new friend to become a Fedora Ambassador for Guatemala, as we need some one helping us over there. Otra cadena se ha iniciado en internet, pero al menos esta es una cadena buena. Al momento ya perdí la pista de quien inició la cadena, y no se quien más la seguirá. En fin es una cadena de internet. Esta cadena trata de mostrar quienes son los que promueven Fedora. Así que luego que alguien se presentó, varios ha seguido la iniciativa mostrando una foto y comentando algo de si mismos. Asi que aqui estoy yo y “Conoce a un Embajador de Fedora”. Another chain has been started on internet, at least this is a good one. So far I have lost track of whom started and I don’t know who is going to keep on sending it. It is a chain after all. This chains tries to show who are those that promotes Fedora. After some one introduced himself (or herself! ), some have followed the idea showing a picture and commenting a bit about themselves. So, here I am and “Get to know a Fedora Ambassador”. Embajadores de Fedora de El Salvador y Nicaragua. Aunque muchos no lo creen, yo si trabajo. Estoy en San Salvador por asuntos de trabajo, aqui se esta llevando a cabo la feria Expovacaciones y yo estoy tratando de promover mi hotel entre los tour operadores de El Salvador. Pero dado que ya estoy aqui, no he dejado pasar la oportunidad de contactar a los actores del Software Libre en este país y en especial, a los usuarios de Fedora. 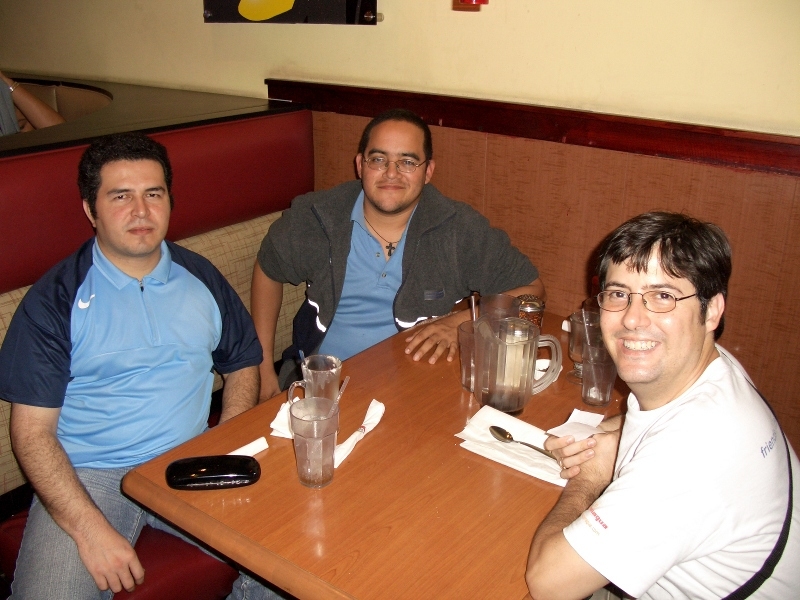 De izquierda a derecha Andrés “Morpheus” Pascacio, Embajador de Fedora de El Salvador, José “Magjogui” López, aspirante a Embajador y Neville “Yn1v” Cross, Embajador de Fedora de Nicaragua. Lo más importante fue conocernos. Yo ya había conocido a José en Estelí, pero ninguno había tenido la oportunidad de encontrar personalmente a Andrés. Intercambiamos ideas de como promover la comunidad de Fedora en El Salvador. Preguntas de como funciona la comunidad Latinoamericana. También hablamos de que hacemos mas allá de Fedora. De paso tome una parte de las calacomanías que me dieron en Brasil durante Fudcon para los eventos de Nicaragua y las entregué. Lo mismo que entregué 25CD y 25DVD en blanco con sus sobres, también parte de lo que me dieron en Brasil para promocionar Fedora. Claro que esto nos llevó a hablar de Fudcon, el FISL y que esperamos que en efecto hagamos el Fudcon en Isla Margarita de Venezuela. Realmente ha sido bueno tomarnos el tiempo para crear lazos y acortar distancias. A final El Salvador y Nicaragua no estan tan lejos. Espero que José complete pronto su aplicación como Embajador. Los planes que formularon suenan bien.